Entertaining a toddler or preschooler indoors can be challenging. They are so busy and curious, and they need so much attention and stimulation all the day. 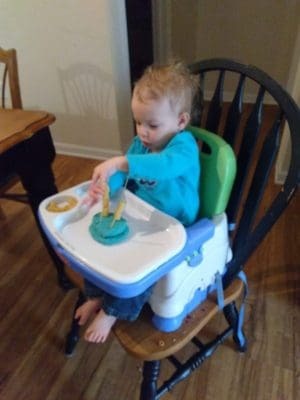 A few weeks ago, my 18-month-old was about to drive me crazy. It was too cold to go to the park, and we’d already been to the library twice that week. Her books and toys had lost their charm, and there’s a limit to how many baths she’ll take in a day. Without resorting to tons of screen time (although I’m not opposed to Baby Einstein occasionally), I needed something new to keep her busy on days we were stuck indoors. 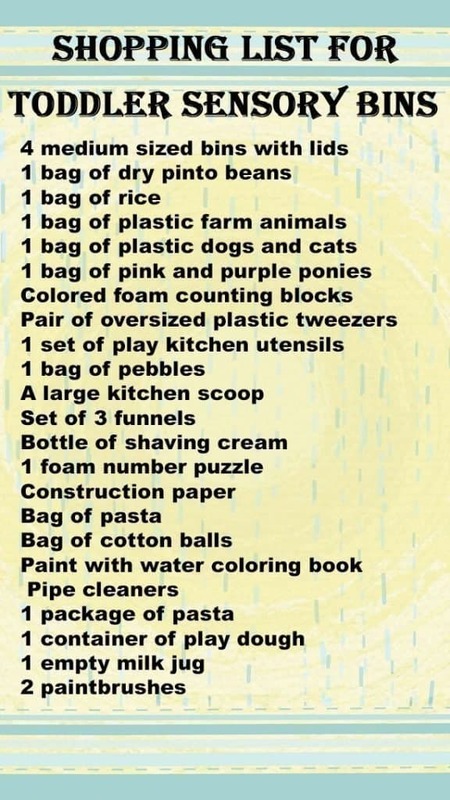 A little Pinterest research sold me on the idea of sensory bins and activities. Sensory play helps with brain development, fine motor skills, language development, and more. 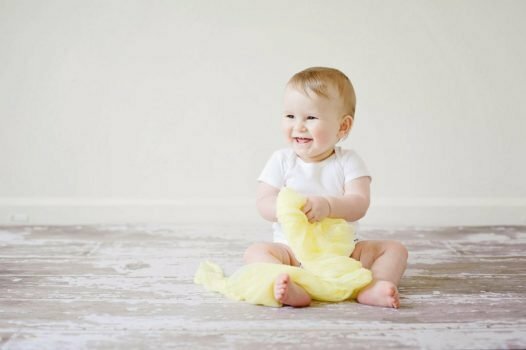 Some young kids thrive on sensory input ,so sensory seeking activities for toddlers are a great choice. 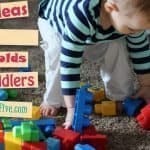 They seemed perfect for my toddler, and many of them are great ideas for older preschoolers as well. 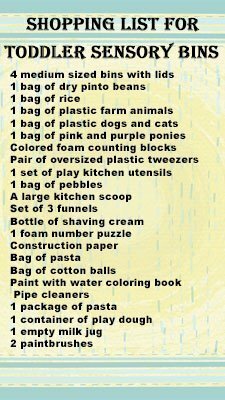 For about $25, I got enough supplies to keep the Little Miss busy for the past two weeks. 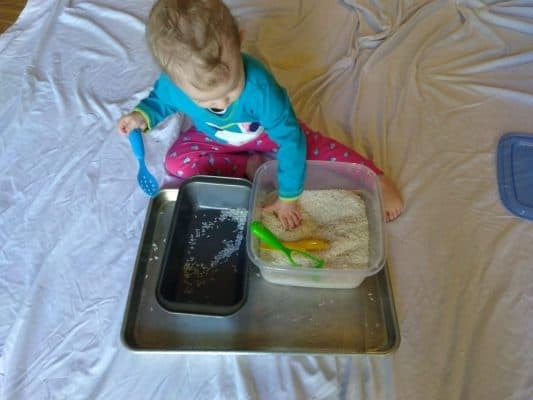 These DIY sensory activities for toddlers were a big hit! With all my supplies gathered, it was time to assemble. I created four sensory bins and gathered everything else for several other fun sensory activities for toddlers. For the first bin, I emptied the plastic ponies in the bottom of a bin and covered them with the cotton balls. It seemed fitting–pegasus ponies in puffy clouds. You can get other animals if your little one likes dinosaurs or bugs and snakes better. Little Miss was intrigued by this bin since she couldn’t see what was at the bottom. She would stick her hands in and pull out one pony at a time, and she was tickled every time. 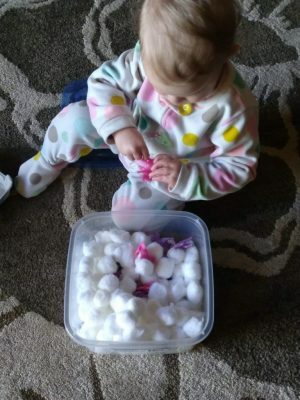 She also enjoyed grabbing the cotton balls by the handful and tossing them in the air. We practiced saying “soft” and touching the cotton to her cheeks. She was curious about how they pulled apart in wispy pieces. All in all, this bin was a hit. Later in the week, I tried to get her to find the ponies in a pile of shaving cream, and she wouldn’t have it. She doesn’t like to get her hands messy or sticky, so that one was a flop. But toddlers who love to get messy would probably love finding animals in a bin of shaving cream! This was the #1 favorite! Little Miss played with it for a solid 45 minutes without even asking me to come play with her! She LOVES it and still asks to play with it every day. I gave her the bin and an empty bread pan so she could scoop beans and dump them into another container. She filled and dumped beans back and forth, grabbed them with her hands, practiced using the spoon, buried her tools in the beans, and generally had a great time. 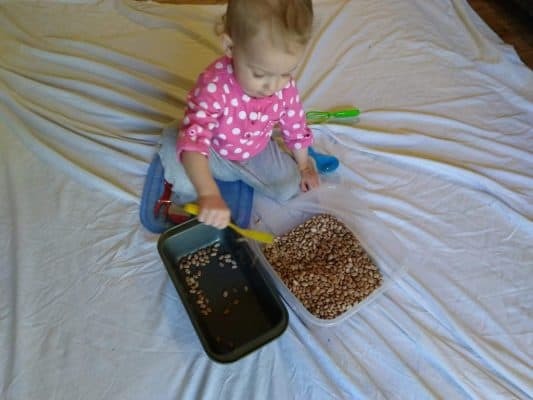 I spread out a large sheet for her to play on, and when she was done, I picked up the corners of the sheet and poured all the spilled beans back into the bin. 10/10 rating on this one. Similar to the bean bin, I added some kitchen toys to the rice bin. Little Miss enjoyed this one about the same. She liked standing and walking on the spilled rice to feel it under her bare feet. I spread out a sheet under her which made clean-up a snap. The second bin had the large pebbles and farm animals and dogs and cats. This was a fun one, but Little Miss didn’t quite enjoy the sensory part as much. She wasn’t too interested in feeling the rocks, but she really liked the animals. We pulled them out and practiced saying the animal sounds, and she enjoyed playing pretend by galloping the horses and petting the cats. 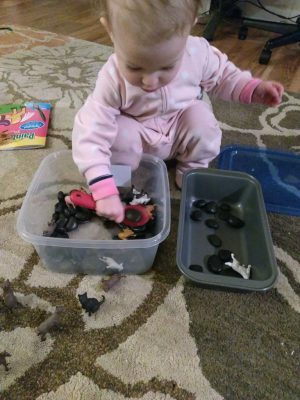 I gave her one of the spoons from the kitchen toys and she did enjoy scooping the rocks out of the bin. This bin was the easiest to clean up, by far. Aside from the bins, I also prepped a couple of sorting activities. While not exactly sensory activities, they were fun and great practice for color recognition and fine motor skills. The foam blocks got dropped inside an empty milk jug and shaken out again. 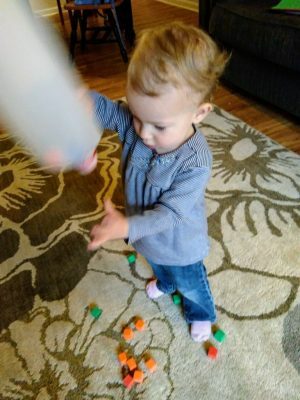 Little Miss quickly tired of dropping the cubes in and mostly wanted to shake them inside the jug. Preschoolers could practice this using the big tweezers instead of their hands to pick up the blocks. NOTE: The foam blocks are a choking hazard so supervise your toddler at all times when playing with them. I also set out a piece of construction paper in each of the block’s colors. Little Miss liked placing the cubes on the matching color and saying the colors out loud. We’ve done this activity a few times, and she still likes it. The pink and purple ponies are also good for sorting, and they are a little easier than the blocks because there are only two colors instead of four. Older preschoolers could also sort them using other identifiers like wings or no wings and sitting or standing. The foam numbers can also be used for sorting. 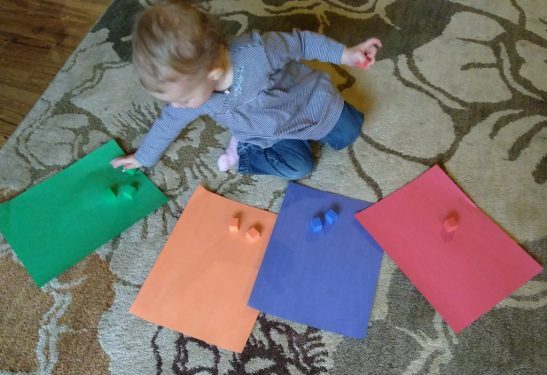 Right now, she’s only good at matching colors, but a preschooler could match the numbers or group evens and odds. 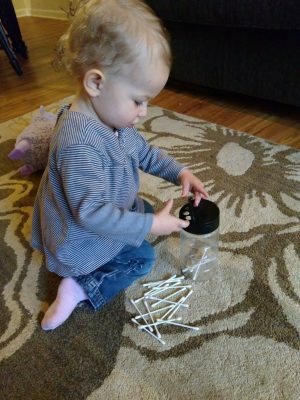 Fine motor skills are important for toddlers, and threading is a great way to practice. I stuck spaghetti noodles in play dough and let Little Miss thread rigatoni onto it. (Play dough is great for sensory play in general. I make my own with this easy recipe.) She tended to break the spaghetti and get frustrated though, so next time I will use pieces of drinking straw. We also tried threading pasta onto pipe cleaners, but the ends bent over when she didn’t line it up just right, so she got frustrated again. That activity is probably best for older toddlers. Preschoolers with more advanced fine motor skills can do cereal on string to make necklaces and bracelets. 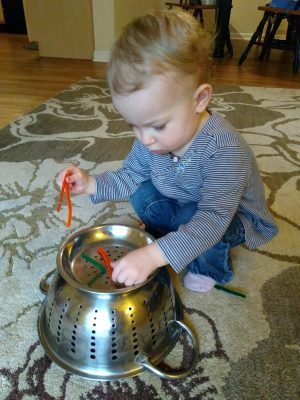 One successful threading activity was putting pieces of pipe cleaner through the holes in an inverted colander. Little Miss loved seeing the pieces disappear when she pushed them through and then revealing them underneath. She also like dropping Q-Tips into an empty parmesan cheese container. The scoop and funnels are for water sensory activities. They are fun in the bath, and I also scrubbed out and filled the kitchen sink with water for some play time. Little Miss stood on a kitchen chair next to me while I made dinner and played with her funnels in the sink. She hates getting her clothes wet though, so I need to get her a smock or apron for next time. The funnels and scoop can also be used in the sandbox at the park in warmer weather. You could also use this for weather sensory activities for toddlers. The “paint with water” coloring book is great. The paint is already on the page, so kids can use just water. It’s all the fun of painting without the mess. A preschooler would probably like this more than a toddler, but it’s been fun so far. Construction paper can be painted on with water as well. It turns dark where the water is, so toddlers can see their “painting.” I like to use a clipboard for the paper so it doesn’t scoot farther away from her as she vigorously paints. 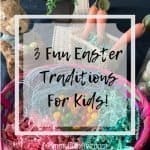 These sensory activities have been a life-saver! 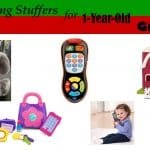 Whenever we get bored at home, I’ll pull out a sensory activity or two, and the afternoon will pass much more quickly. Little Miss has been whining less, and she’ll often ask for an “activity” and point to the closet where I keep everything. For only a little money and effort, we’ve been having screen-free entertainment for weeks!